A 58-year-old man has been arrested after allegedly attempting to desecrate Poland’s most revered religious icon, the Black Madonna of Czestochowa. According to police spokesperson Joanna Lazar, the man struck at about 8 am on Sunday while visiting the Jasna Gora Monastery in Czestochowa, southern Poland. The suspect allegedly lunged forward from among a group of worshippers, throwing a pail of what is thought to be black paint over the icon. Owing to a pane of protective glass, the icon itself survived the incident unscathed. “The faithful are calling us with tears in their eyes, asking what has happened,” revealed Father Robert Jasiulewicz, spokesman for the Pauline monastery, in an interview with the Polish Press Agency. “We are calming them that the painting is in one piece, and that it has not been damaged in any way,” he added. Joanna Lazar has said that the man will probably be charged with “desecrating a religious space,” for which he could face up to two years in prison. However, she declined to reveal any more details about the case, or the suspect himself. 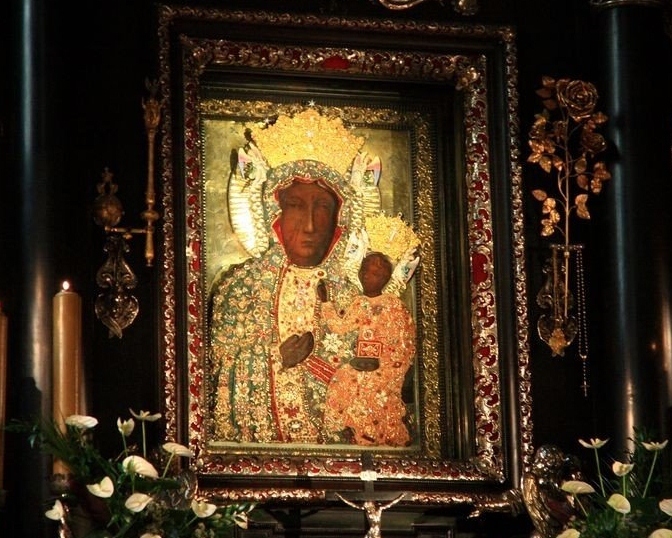 The Black Madonna is understood to have been brought to Czesctochowa in 1384, but its origins are still hotly debated. It is believed by many of the faithful that the portrait of the Mother of God was painted by St Luke the Evangelist, and was supposedly owned for a time by the Byzantine Emperor Constantine. When the fortified monastery endured a 1655 siege by Swedish invaders, the icon became increasingly venerated across Poland.